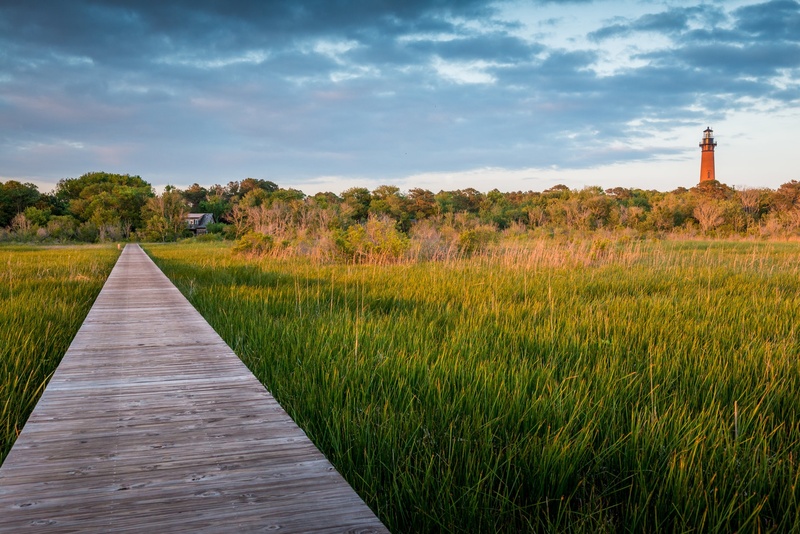 Currituck County is located just minutes south of the cities of Norfolk, Virginia Beach, and Chesapeake across the border of Virginia and North Carolina. Our unmatched quality of life, the best beaches on the East Coast, and a balanced economy make the area strong. The diversity and strength of the regional business community supports growth even during challenging economic times. Geography allows businesses located in Currituck County to experience the best of both worlds. Currituck County enjoys a very low tax rate of $0.48 per $100 value, an educated workforce, high quality of life and excellent regional transportation access. This allows Currituck County to capitalize on a customer base of 1.6 million people in the Virginia Beach-Norfolk-Newport News MSA, the 4th largest metropolitan statistical area in the southeast. Currituck County's access to Interstate 64, which runs near the northern part of the county, is the provided by NC 168 and the Chesapeake Expressway. We are joined together by an excellent network of US and state highways.Home to one of the largest military installations in the nation, the region also boasts the second largest deep water port on the east coast, only 18 miles to open sea, and less than 30 miles from industrial locations in Currituck County. Operations have increased 400% over the last decade at the Currituck County Regional Airport. With the expansion of the airport runway to 5,500 feet, the Currituck County Airport is the only North Carolina Outer Banks airport serving business jet aircraft. Major expansion is underway creating a full parallel taxiway, upgraded fuel facilities and a shovel-ready business park offering sites with direct highway or Airport access! Commercial air service is just minutes away at the Norfolk International Airport, which served 3.7 million passengers in 2006 with nearly 200 flights daily including non-stop flights to 22 cities. 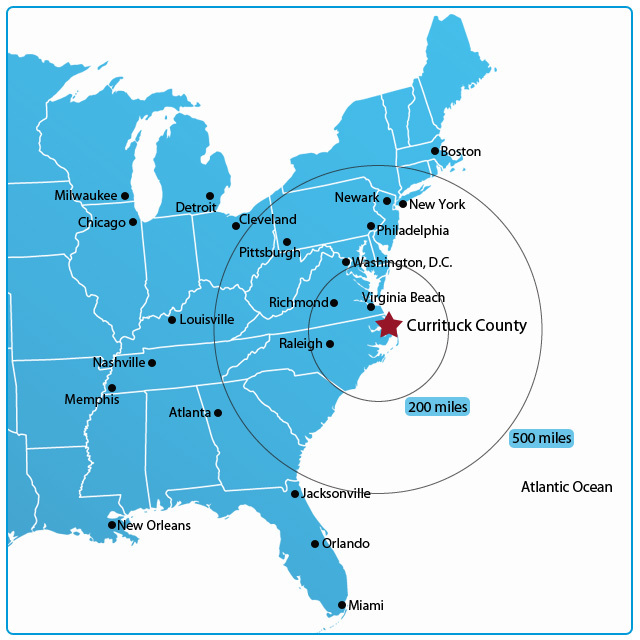 Currituck County is positioned near the heart of one of the largest, most consolidated rail systems with a direct link to 2/3 of the U. S. population and inland shipping centers throughout the county. Class I service is provided by Norfolk Southern and CSX, with a direct connection provided via the Chesapeake & Albemarle short-line railroad in Currituck County. As part of the North Carolina famous Outer Banks, Currituck County offers an unparalleled quality of life, including excellent schools. With its closeness to the Hampton Roads area, Currituck County offers easy access to national cultural events and first class entertainment facilities of a major metropolitan area. Local outdoor activities include boating, kayaking, swimming, hiking and playing golf on some of the nation's most outstanding courses. So, why Currituck County? It offers the best of the best - quality of life, excellent business climate, location, and accessibility. North Carolina incentives make the move to Currituck County a smart one. Our reasonable cost of operation and productive labor force make staying in business here even smarter. Have questions for Currituck County Economic Development?